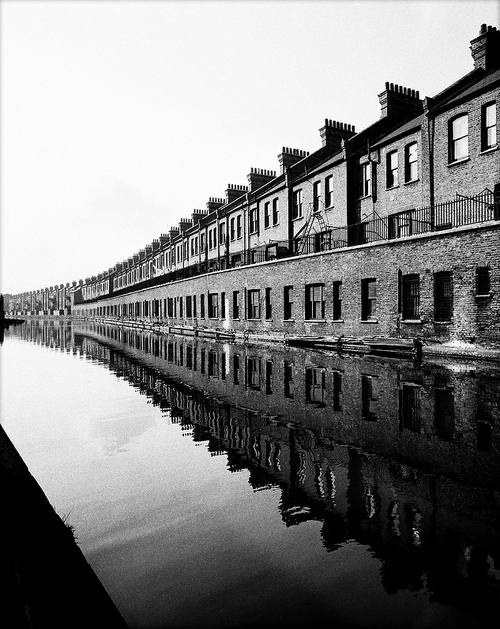 The photograph that makes me think is called "Grand Union Canal"by Bill Brant.When I first looked at this image I was drawn to the repetition of the consecutive buildings that is reflected in the canal.When looking at this image I started to wonder when did this image begin or even end.This makes me think of the way of life that it is continuous flow of many journeys.When looking at this image I am drawn to the lightest tone of the image which is the sky and the reflected sky in the water this effect is framing the image to make your eyes get drawn to the detailed darker tones of the buildings. The way the building flows makes me feel that the main idea of the image is a positive flow.The reason why I say this as my eyes flow into this image it makes me feel like I’m flowing through a journey of my own e.g. life, the lightest tones as the positives and the dark tones as the negatives. I feel what makes this image have a positive feel is the consecutive leading lines from the foreground of the image to the background.This to me insinuates that even though life can get difficult and have bumps in the roads life goes on.